The European Union celebrates Europe Day on May 9 to commemorate the 1950 Schuman Declaration proposing consolidated European coal and steel industries, binding the member nations so closely together that renewed war would be unthinkable. The Schuman Declaration is considered to be the genesis of what is now the European Union of 28 Member States with a combined population of half a billion people. You can access the documentation of this supranational organization right here in the Law Library, which serves as a depository for official EU documents, including many on EU law. See our Guide to EU Documents in the Law Library and learn more about the European Union on its official site Europa as well as the trans-Atlantic partnership on the site of the Delega tion of the European Union to the United States. 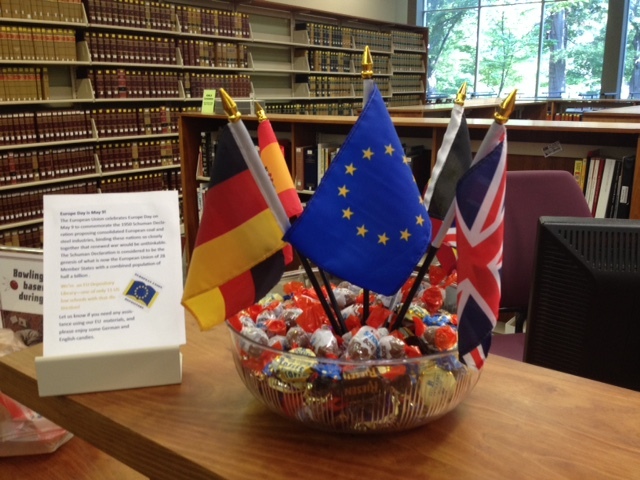 Please contact Anne Burnett any time for assistance with using our EU depository material, and drop by the Reference Desk today for some celebratory German and English candies!